Each feature is an independent window that allows you to arrange your LightFactory system how you like it. Spread different windows over multiple monitors and the software will remember this setting for next time. Supports industry standard USB and Ethernet DMX interfaces. Access channels, groups, cues, effects, and macros quickly and easily through shortcuts. (100 pages of 100 shortcuts) Implemented onscreen or through the LightFactory shortcut keyboard. 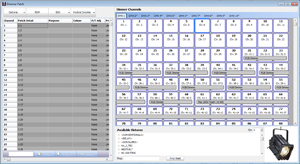 Access channels and intelligent fixture attributes from a simple command interface. The last 100 commands can be viewed in a history window. Easy to customize fixture library. Ability to assign a picture to every fixture for easy recognition. Additional information can be stored with every channel - purpose, colour, power, unit #, fixture type, weight, circuit, dimmer phase, accessories and 3 additional generic data fields. View more than 450 Channels on a standard 1200 x 1024 display. View only the attributes related to that channel when an intelligent fixture is assigned. Intelligent fixture control visible only when an intelligent fixture is selected. Ability to dock the intelligent fixture control to the channel window or leave it floating free. Quick access to creating new channel groups, cues, palettes, selection shortcuts and effects. Switch between traditional character, compact or detailed view of the channels. Copy channel state to temporary memory, restore, load state from cue options. Displays a picture of each fixture for quick reference. Unlimited* number of channel groups. Available group modes include ? Build, Override, Exclusive, Highest Takes Precedence, Independent, Inhibit and Hue(LTP). Groups can be assigned to a shortcut key as selection shortcuts, toggle and apply. Select all, Unselect all, Select inactive, and Select active options. Group channels can apply to any fixture attribute. E.g. A group may control only the dimmer, pan control, or both. Shortcuts can be assigned to a macro for running the macro anywhere within the software. Additional commands are available in macros to help build useful tools. E.g. Sleep will cause the macro engine to delay executing the next command. Variable system allows for dynamic macros. Debug any operation by viewing the output dimmers directly. 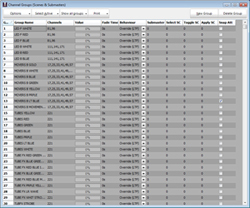 Unlimited* cue lists can be created to split up a show into manageable units. Auto follow and part cues. Cues can wait for user interaction or continue automatically. Each cue can have its own delayed start, fade in, dwell, fade out, and effects delay start. 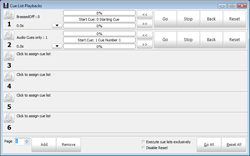 Every attribute in a cue can have a different fade time for complex timing. Each effect within a cue can be assigned a delayed start, override length and whether the effect will loop until the cue ends. "Auto Mark" function can be used to automatically setup intelligent fixtures. 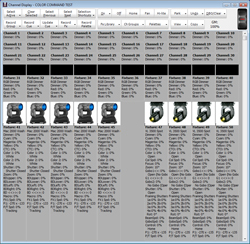 Include full palette reference for every attribute. Access any number of cue lists through a simple interface. Each playback has a bold description (editable) to make identification easy. Each playback has a progress bar and time indicator to show position through the cue. Also displayed is the current cue number and next cue number. Each playback includes ? Go, Stop, Back, and Reset. Each playback can be assigned a go sub-master. Go sub-masters override the fade time of a cue and use the sub-master position as the transition point between cues. Ability to set a shortcut key to quickly apply fixture attributes. E.g. Setup you favorite CMY colors or Gobo's for quick access. Palettes can be referenced in cues. Palettes are completely generic and can be applied to any fixture. The software will calculate how to apply the palette to the fixture. Effects are built using a unique sequence type editor that gives the user a simple graphical view of time vs fixture. 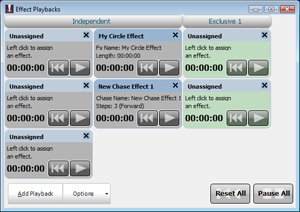 Chases can be created using a simple interface. Intelligent fixtures will automatically work out when they are free to prepare for the next time the dimmer is on. During a dark period of the effect the fixture will automatically setup properties such as pan, tilt, and color for the next segment. Use the auto-effect option to create simple chase sequences. The advanced path editor can be used to create moving light sequences. Each fixture can have its start offset for even more control. Multiple audio effects can be played simultaneously. A compact interface allows the user to maximize the number of effects that can be controlled from one view. Each playback shows a description, the effect name, how long the effect runs, and what shortcuts are assigned. Each effect playback provides back, play, and pause control. A sub-master can be assigned to an effect runner to control the overall dimmer intensity. An exclusive group can be assigned to make sure only one effect is running within that group. Assigning exclusive group 0 will allow the effect to run independently of all other runners. Effect length can be adjusted and rescaled per runner. Playbacks can be set to one of 3 different sizes. Ability to lockout users from any part of the software to prevent tampering. All show information stored in a Firebird SQL database. Built in backup of the SQL database every time the software closes. The current show is always being saved to an internal show.